You might notice there’s a different pair of disembodied hands in the post this week. That’s because my lovely housemate was on half term, and ever since we watched this year’s GBBO we have wanted to make our own doughnuts (I’ve been informed donut is the wrong way to spell it). Thanks for your help Vicky and for very patiently allowing me to photograph the occasion. We’re having a little get together for bonfire/fireworks night on Wednesday and we thought we would make some appropriately themed treats. 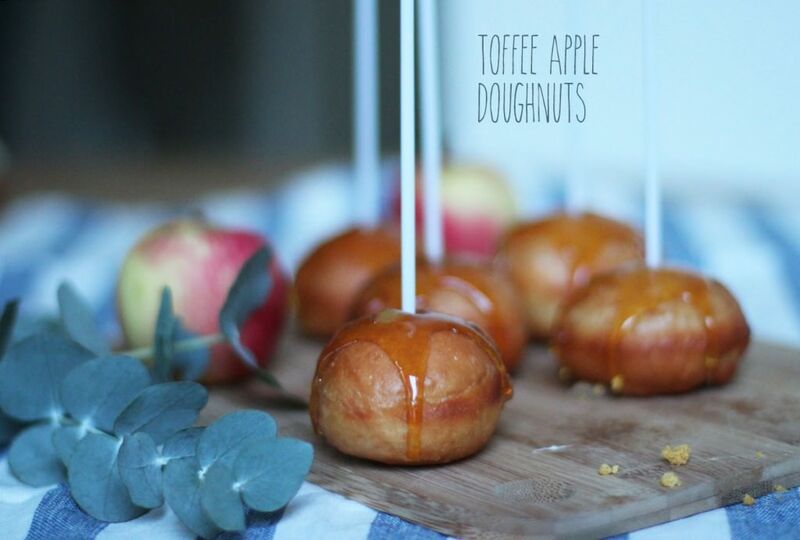 We bring to you a doughnut double whammy, flavoured with toffee apple and cinder toffee. Disclaimer – these aren’t quick to make, but they are IN-credible, I was very sad to put them into the freezer, and I hope they emerge as delicious as they went in. Please note: doughnut recipe makes 30, so the extra flavourings recipes are for 15 of each. 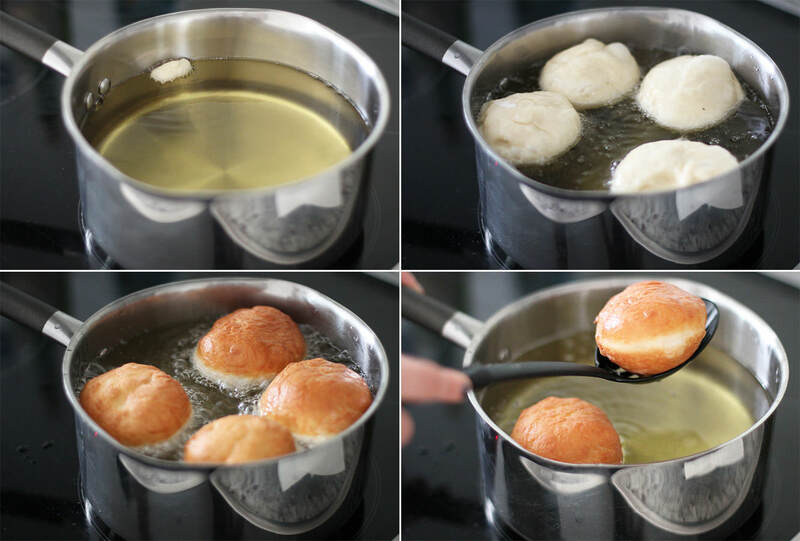 If you want to make just one of the versions you will need to double the quantities of the fillings and toppings or halve the doughnut mix. Put the yeast in the warm water and wait until frothy. 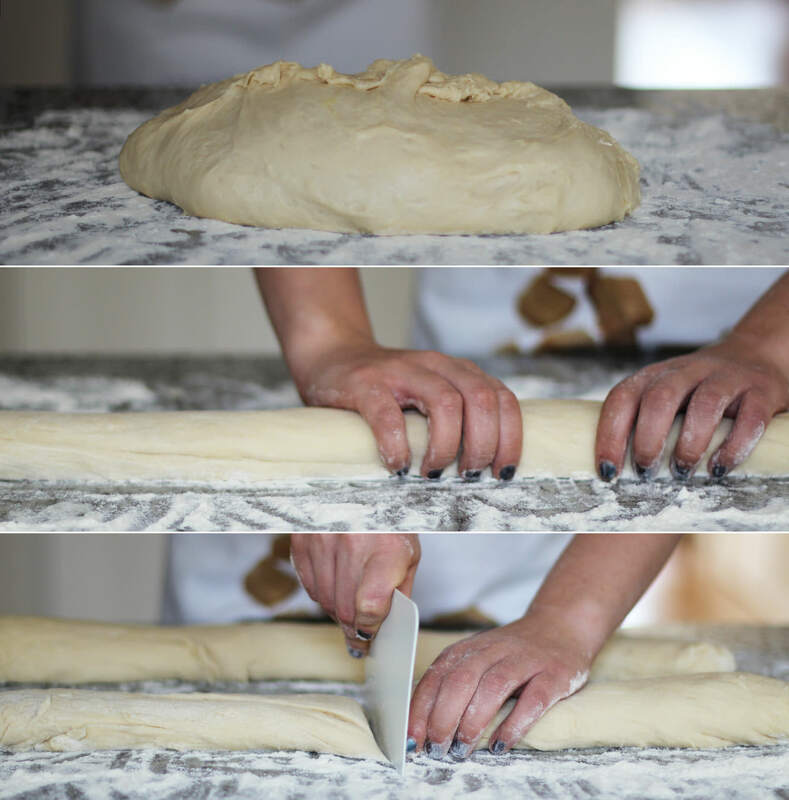 Combine half the flour with the rest of the dough ingredients (including the yeast froth). Remember to put the yeast and the salt on opposite sides of the bowl, they don’t get on. 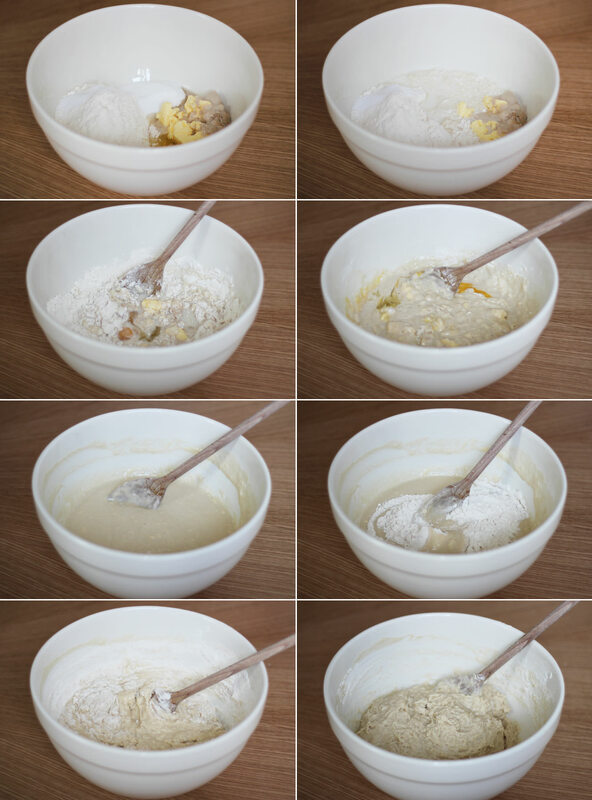 When the batter is smooth, gradually add the rest of the flour and stir. The dough should be sticky but not impossible to work with. Vicky and I found we had to add a lot of flour in kneading so I’ve adjusted the recipe for y’all. 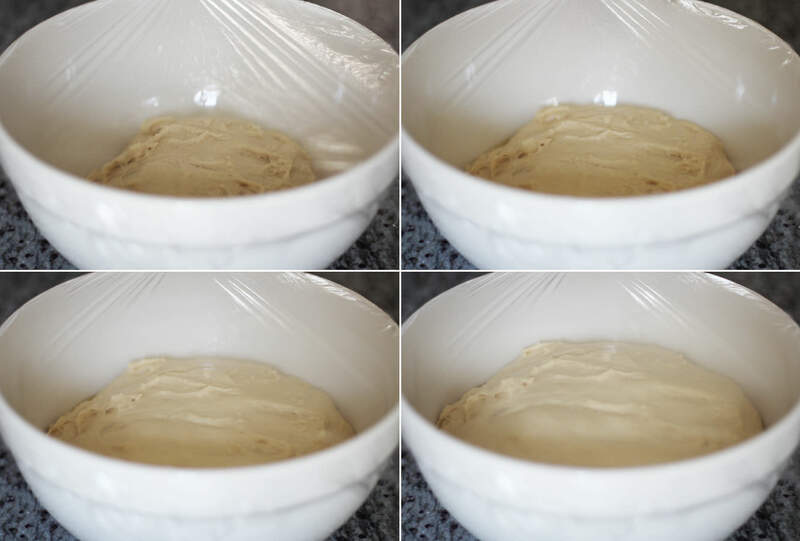 Turn the dough out onto a floured surface and knead for 5-10 minutes. It’ll still be quite sticky, don’t sweat it. Place in a lightly oiled bowl and leave to rise for an hour or until doubled in size. While that’s going on you can prepare your toppings and fillings. 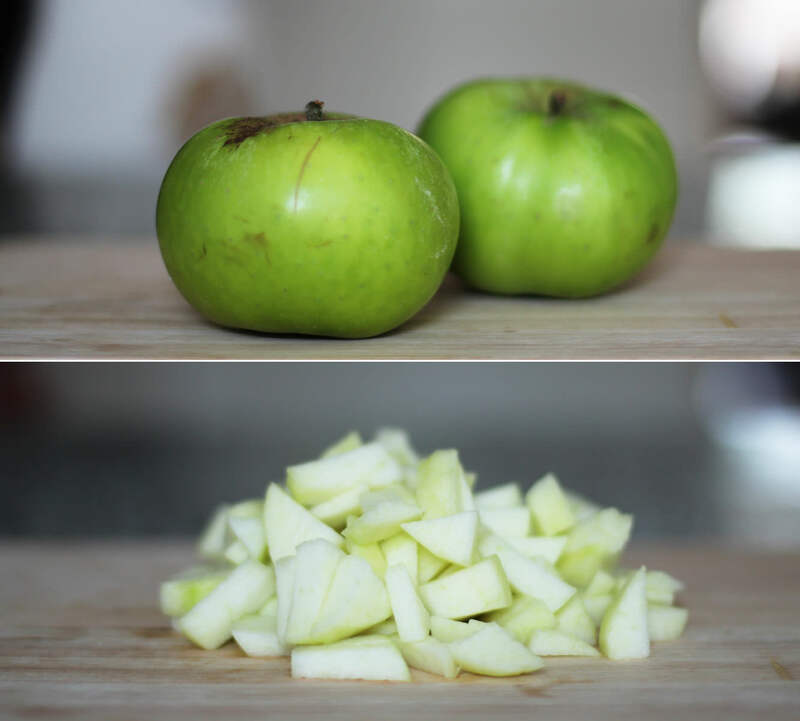 For the puree which will fill the toffee apple doughnuts, peel and chop the apples into small chunks. 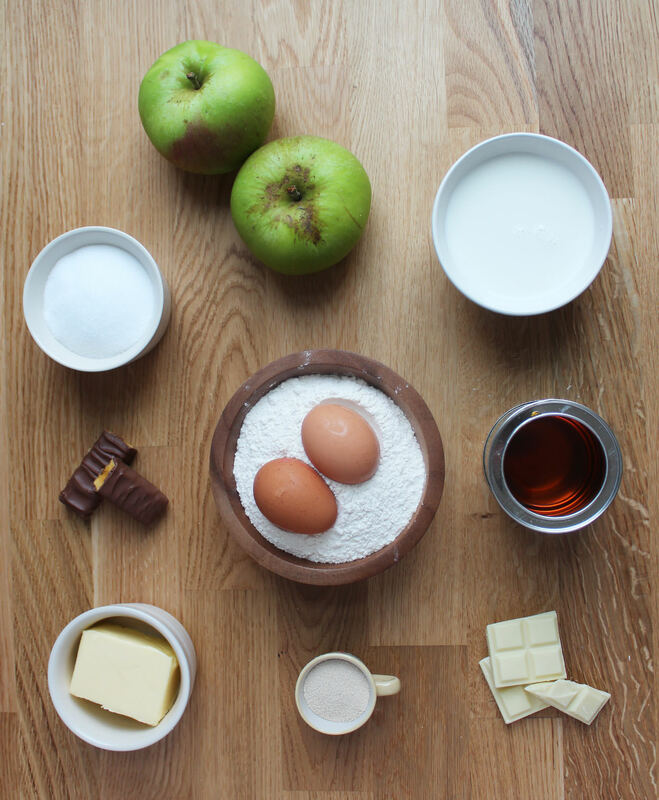 Place the apples in a saucepan with the 3 tablespoons of soft brown sugar and 1 tablespoon of water. Heat on medium until the apples have reduced. 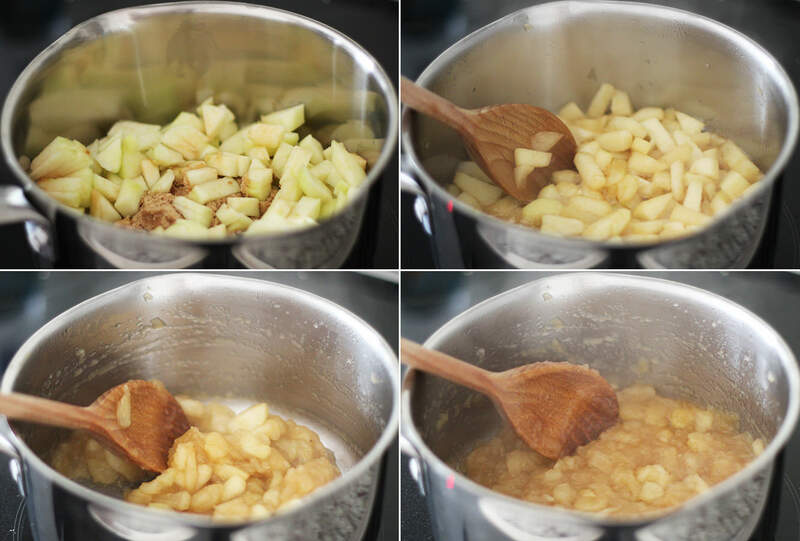 If you have one, use a food processor to liquidise the apple mixture. If you don’t, do what we did and use a potato masher and then pass the mix through a sieve. To make the filling for the cinder toffee donuts combine the butter, icing sugar, milk, golden syrup and vanilla extract. 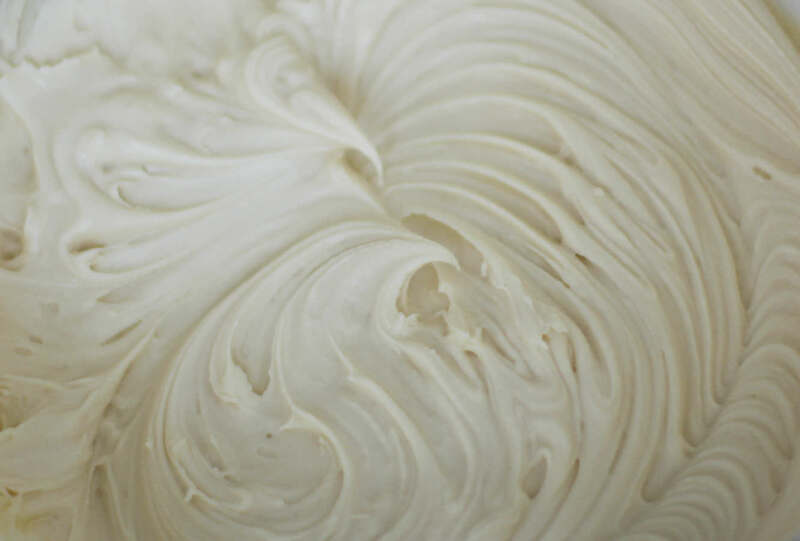 Whisk until smooth and set aside. 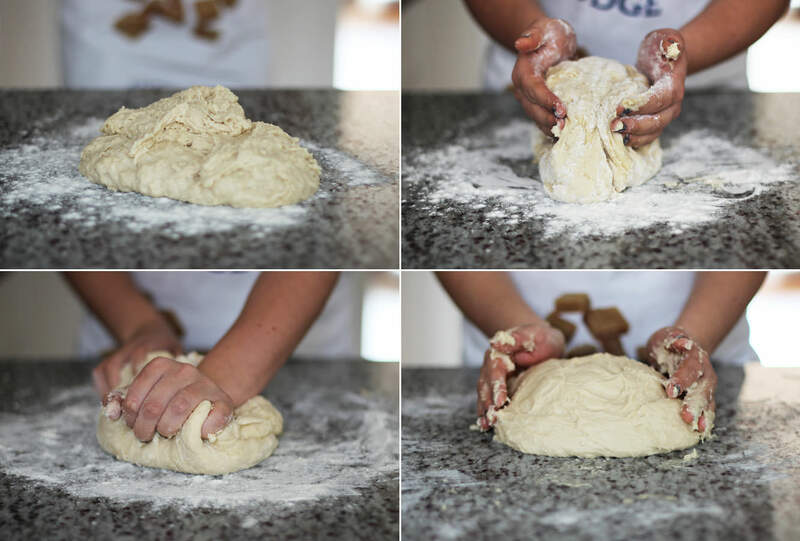 Tip the risen dough onto a floured work surface. Squeeze into a long sausage shape and chop into 30 pieces. Roll into balls and leave on a tray to prove for another hour. Make sure you leave plenty of space. The picture above was before these rose, and they almost filled the tray after. 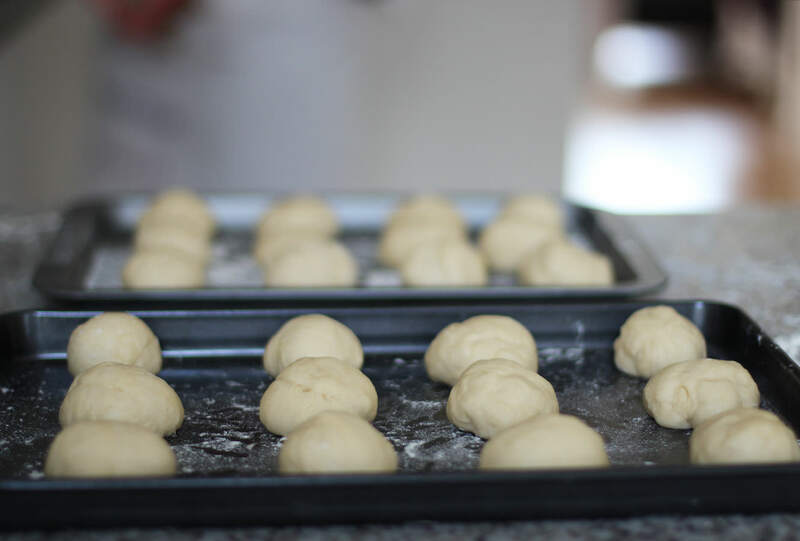 About 20 minutes before the doughnuts have finished their second rise, begin to heat the oil. It’s beyond important that you heat the oil really slowly on a low heat to avoid risking a pan fire. There’s no reason to worry as long as you heat this gradually. 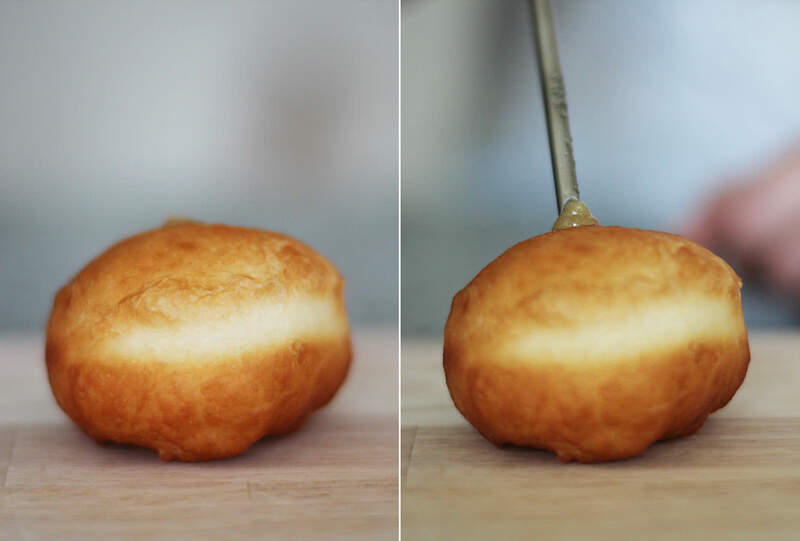 Test your oil heat with little pieces of a doughnut. When the sample floats and bubbles straight away you’re good to go. Fry the doughnuts in batches, you will get a good idea when to turn them pretty quickly, it only takes a few minutes for them to get golden. 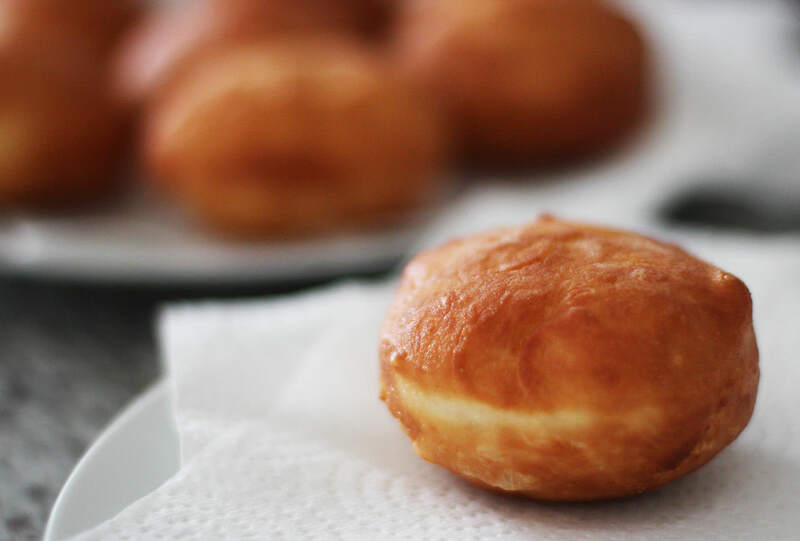 Leave your doughnuts to rest on a few sheets of kitchen roll which will soak up any excess oil. When the doughnuts are completely cooled inject 15 of them with the apple puree and 15 with the cinder toffee filling. We went in at the top because we knew we were going to cover the holes, otherwise you would use the side. 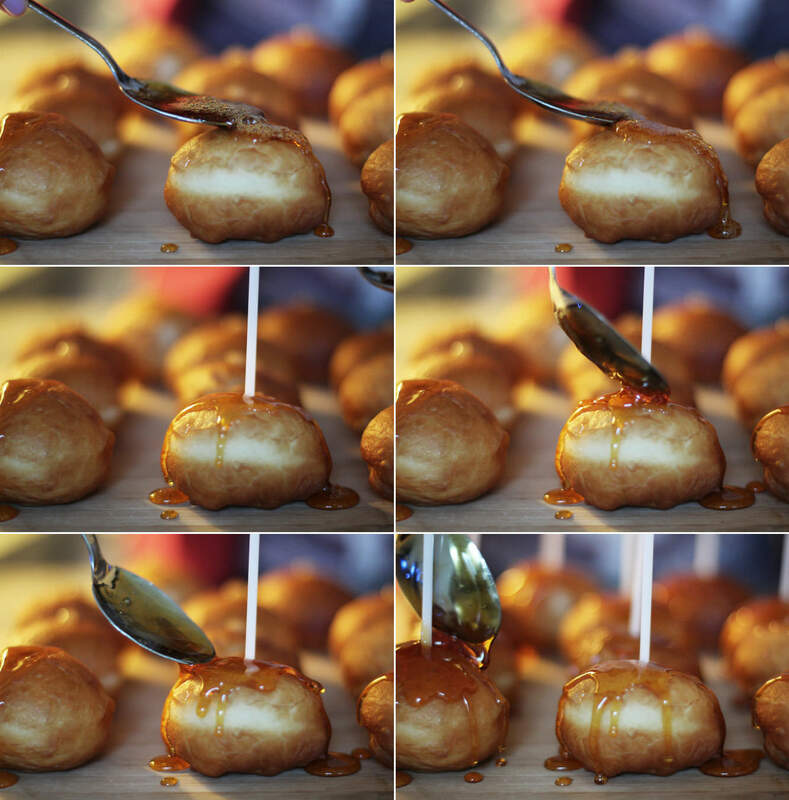 For those of you with a flavour injector (and of course that will be most of you…) we did 10 ml per doughnut. 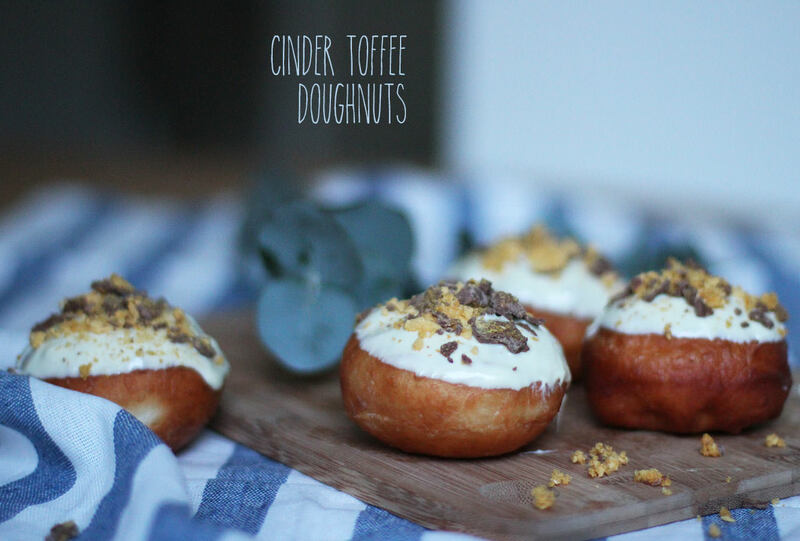 For the cinder toffee doughnuts you need to crush up the crunchie bars (easily done when they’re in their wrappers) and melt the white chocolate. Do this slowly in the microwave to avoid burning it. Dip the doughnuts in the chocolate to coat the upside down top, and sprinkle with crunchie pieces. Leave to one side for the chocolate to set. Make a hard caramel by combining the 300g of granulated sugar and 6 tbsp water in a saucepan. Heat on a low-medium heat until the mixture takes on a dark honey colour. Do not stir it as the sugar will crystallise. I’m afraid I did this by eye so I don’t have a temperature, but use the pictures above for a reference point for the colour and you’ll be fine, it’s not an exact science. Remove from heat and cool by dipping the bottom of the saucepan in a mixing bowl full of cold water. Spoon over the top of the doughnuts. I did one layer on each and popped the sticks in, then went back once the caramel got a little thicker (this happens as it cools) to do another and to secure the sticks in place.